"Koselig" is a Norwegian word that can be most easily translated into the word cozy. However, it embodies so much more than that. Koselig is the sensation of comfort you feel when returning to a familiar place; it is the tranquility of sitting with friends around a campfire; it is the overwhelming happiness you feel when you embrace a loved one. Koselig is an atmosphere, an idea, a way of being. Now it is something you can put on and share with others. Koselig's purpose is to bring physical interaction back into the relationships of those who are separated by distance. Friends, families, and lovers can use Koselig to send one another a "nudge" or to make a call in a more pleasant and intimate environment. A single Koselig system is made up of two garments. 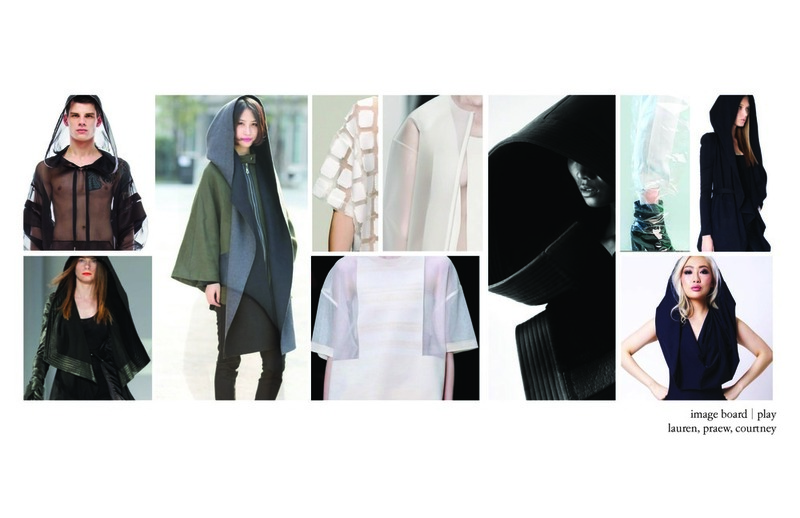 Each garment has features that connect to and interact with the other wearer's garment. By touching the hand to the heart, a user can send a "nudge", or small shoulder vibration, to the other member in their system to let this user know that he or she is being thought of. 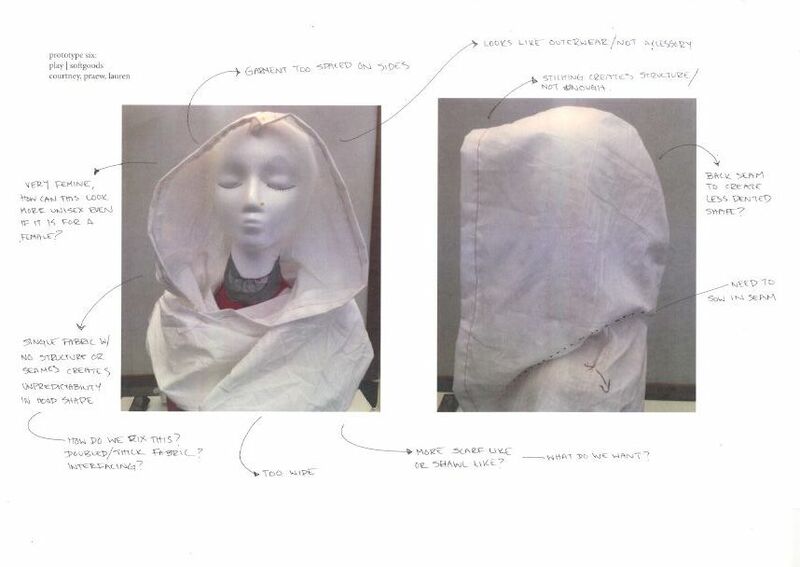 By putting the hood up, a call can be initiated or accepted and a warmer, quieter environment is established. This allows for increased comfort and a closer communication experience for those separated by distance, making users feel like they aren't so far apart. 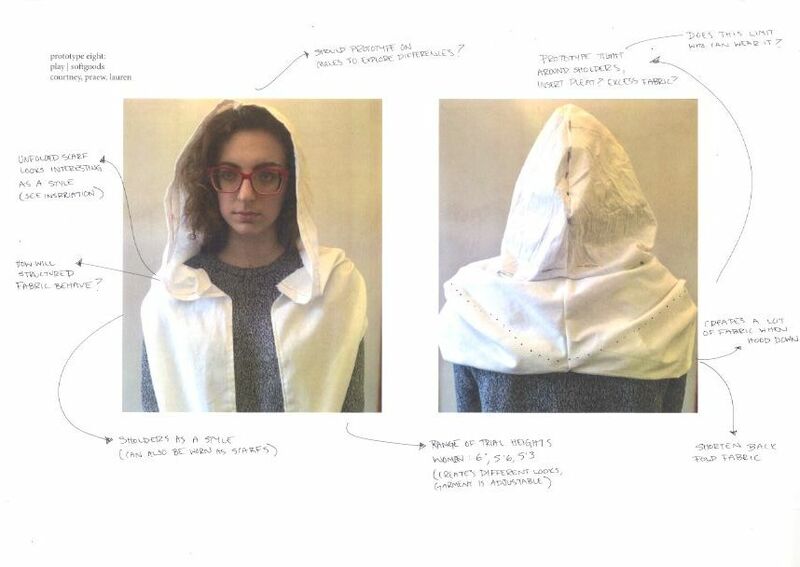 Koselig was created by a simple Arduino system that is housed by a soft shawl/hoodie ensemble by me and my classmates Lauren Zemering and Courtney Pozzi. Koselig is an interactive softgood designed to bridge the gap between online and physical interactions. In this project, we all started off by brainstorming our ideas, conducting research, creating moodboards and mapping out possible experiences together. I was involved in the sewing and soldering of the softgood with Lauren, and co-created the product pamphlet with Courtney. I was also in charge of creating the graphic representations of our product to be used in our final product pamphlet and deliverable packet. Many young adults (18-26) often have to be apart from their friends and/or loved ones as they are in a transitional part of their life, moving around for school, for jobs...etc. This can affect them emotionally, making them feel homesick or have difficulty adjusting in a new environment, without the support of some of the most important people in their lives.Many relationships can also weaken, and this is due to the fact that they are not able to share fun experiences with one another, and the intimacy of physically being next to each other is also missing. "Koselig" is a Norwegian word that can be most easily translated into the word cozy. However, it embodies so much more than that. Koselig is the sensation of comfort you feel when returning to a familiar place; it is the tranquility of sitting with friends around a campfire; it is the overwhelming happiness you feel when you embrace a loved one. Koselig is an atmosphere, an idea, a way of being. Now it is something you can put on and share with others. 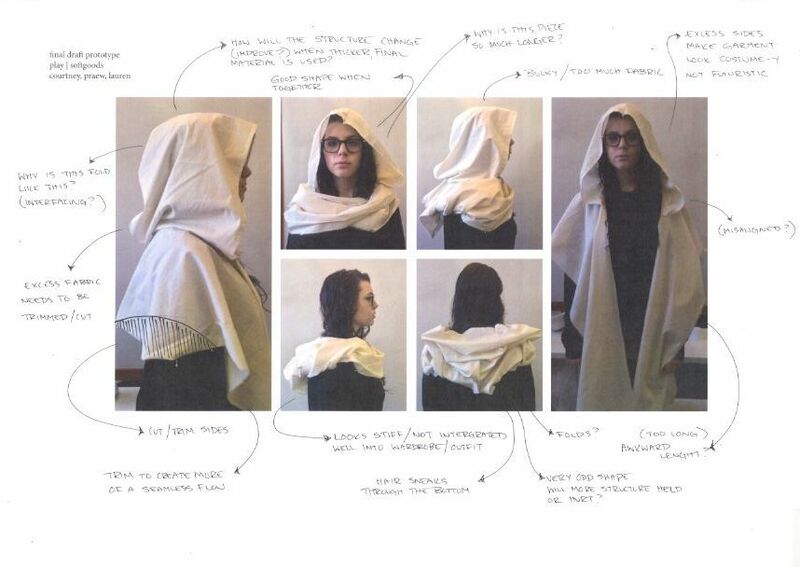 Koselig was created by a simple Arduino system that is housed by a soft shawl/hoodie ensemble, created by me and my classmates Lauren Zemering and Courtney Pozzi. Our final product pamphlet. 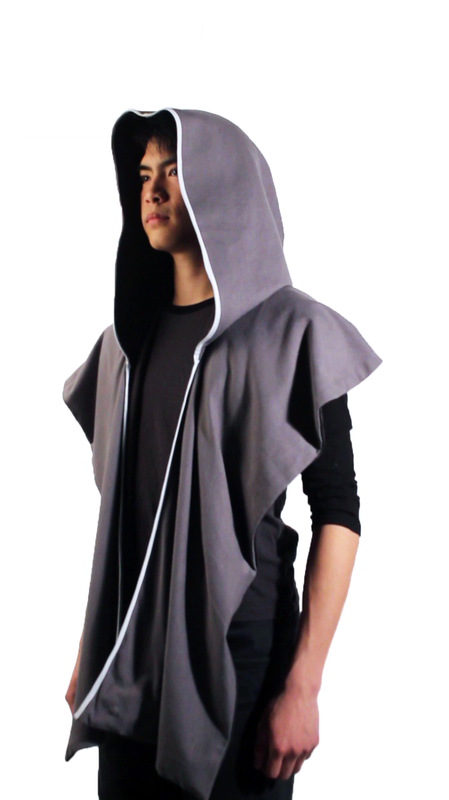 It is a 3-part foldable, including a foreword to what Koselig is, instructions of how to use the garment, special details of the garment, and a personalized thank you message from us to the users. Our piece was featured in our class' Senior Final Show that was set up in the Miller Gallery. We had a working demo session during the reception night, and got a lot of positive and excited feedback about our product! With the prompt "Play" we started off by defining what we thought "Play" meant: "A shared, enjoyed experience". From this we started brainstorming on how different people "play" (build, mimic, guess...etc), why people enjoy playing and which senses would/could enhance this experience. We then focused on the problem of how friends and lovers that are separated by distance are not able to have as intimate of a "shared, enjoyed experience" with one another, with just the current online games/programs/interaction methods that are available. With the prompt words we had up, I thought that it would be a good idea to pair random post its together from each category, to create unique pairings that we would have not though of - this stimulated our brains to think of new ways to "play". We then started benchmarking different already existing products/services that aim to connect people that are separated by distance. Pillow Talk and the HugShirt were the two products that we used as inspiration: products that provides warm interactions that mimic physical touch. To figure out what kind of interactions friends/lovers enjoyed the most when they are with each other, we sent out a survey to the students of Carnegie Mellon University.